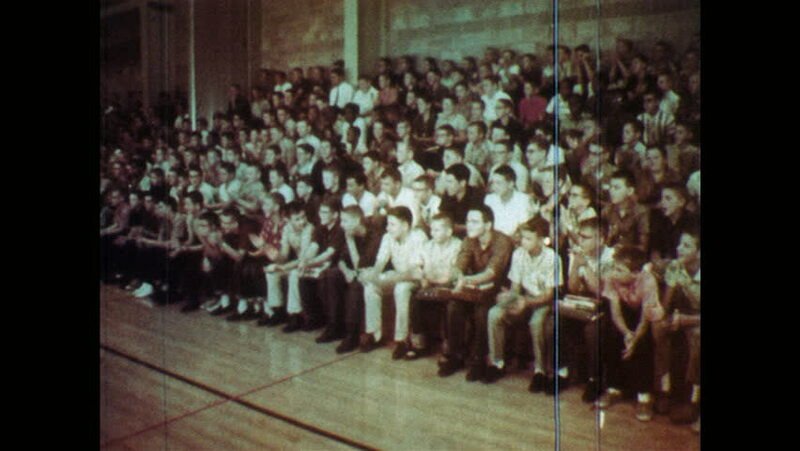 1960s: Students sit on bleachers, clap. Cheerleaders cheer on stage, jump up and down. Cheerleaders jump up and down on floor. Students sit at desks in classroom, teacher hands papers to students. hd00:18UNITED STATES: 1970s: Race track and seats in Vermont. hd00:231960s: Choir on stage, three guitar players stand and sing in front of the choir, musicians play wind instruments in the back of the choir. hd00:27UNITED STATES 1950s: Students in Audience Clap in Time to Students Playing Instruments on Stage. Boys Bang Drums as Children in Audience Clap Hands. Copies of the Museum Gazette on a Desk. hd00:36DNIPRO, UKRAINE - JULY 1, 2016: Famous Violinist Dmitry Tkachenko and Academic Symphony Orchestra - main conductor Natalia Ponomarchuk perform at the Potemkin Palace. hd00:221960s: Long shot, choir singing on stage. Low angle view, man singing on stage, men enter side of stage. Men walk in front of choir and wave. hd00:221950s: People at dance. Blind man in chair reaches for glass of water. hd00:18UNITED STATES 1960s : As police officers approach protesters, members of the violent crowd attempt to take the officers' baton. 4k00:281940s: Women in colorful costumes gather around women in blue dresses.